Yep you read that title right, but this is actually a book title. 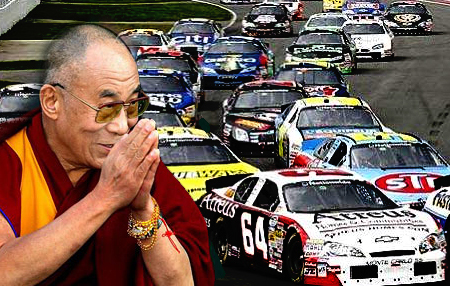 “Buddha on the Backstretch” is about how to deal with handling all the little setbacks in life with a mindful approach learned from Buddhism and from Dale Earnhardt. We suggest reading this book to handle your 4 hour commute to work. Interestingly the book was written by racing fan and female writer, Arlynda Lee Boyer. She is a southerner that grew up with her dad’s love of racing. She has intermixed how NASCAR with a little meditation can get you through your day. It is more about our approach to dealing with the everyday chaos that affects us and how we tend them. For example, how do you react to road rage? B. Start honking your horn, shouting some expletives that probably only you can hear since you have your windows rolled up. Your blood is boiling and that middle finger is about to be extended for all drivers and passengers of all ages to see.